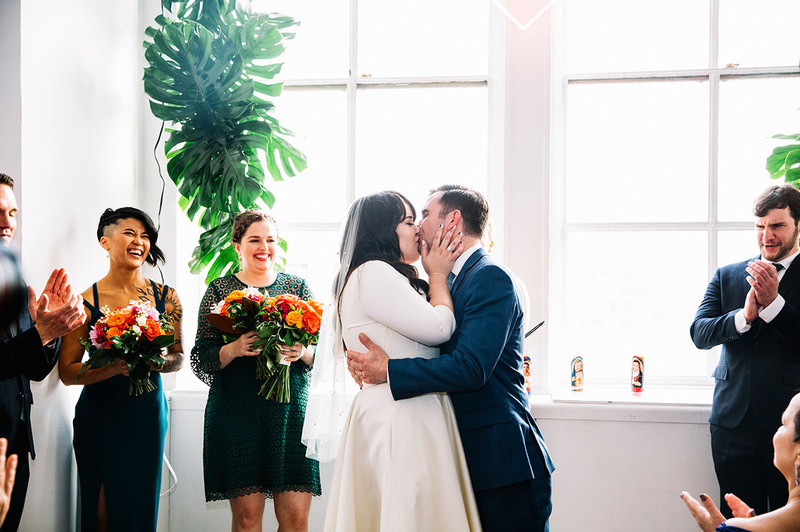 If you’ve ever had the pleasure of roaming the streets of New York City, then you’ll know a “tropical oasis” isn’t really anywhere to be found (sure there are a few restaurants + themed bars)… Well, Kathryn + Zach wouldn’t have that! 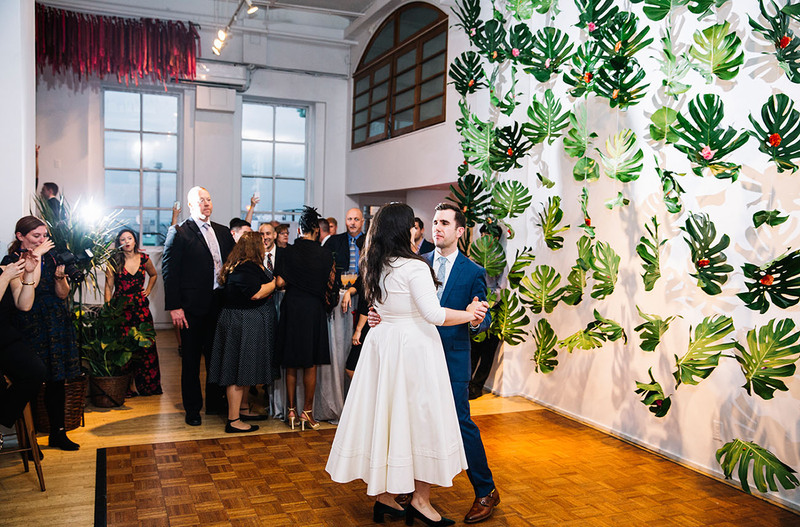 They imagined a mixture of Palm Springs Mid-Century modern details, with a splash of Miami’s Art Deco neon character, along with tons of tropical-themed greenery! 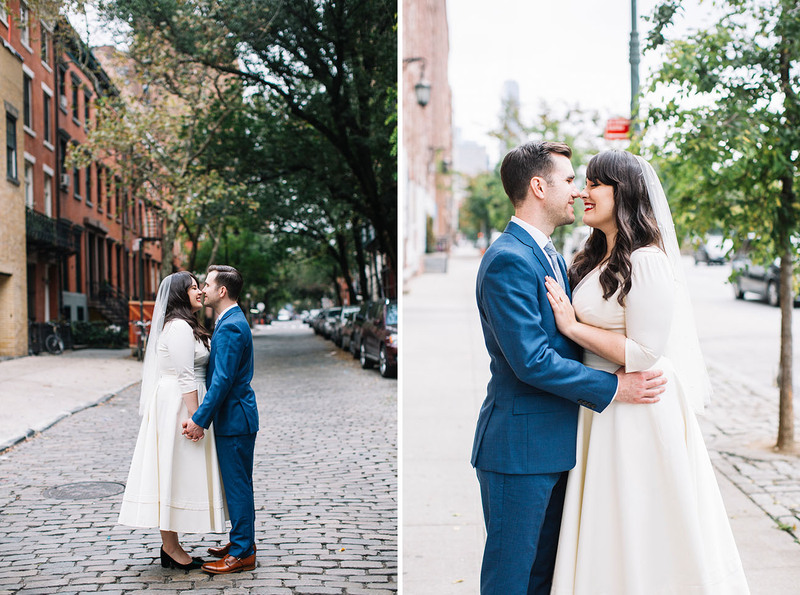 All, of course, with the backdrop of the magical NYC skyline. 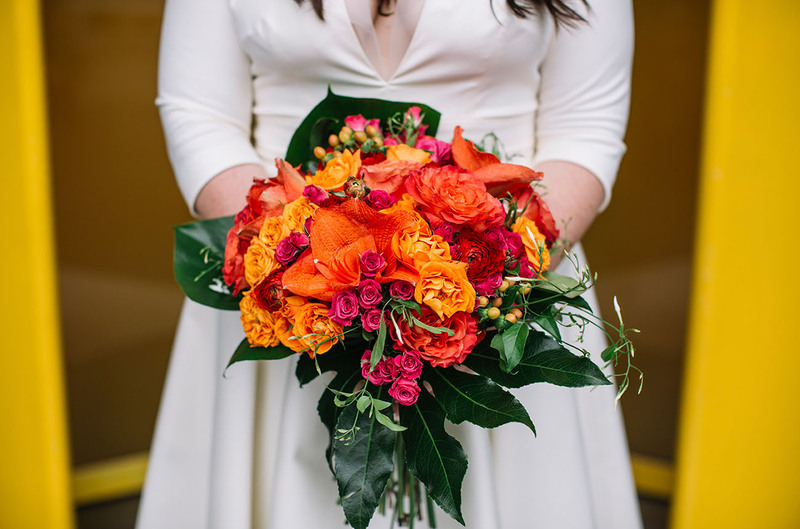 As bride Kathryn is a designer, it comes as no surprise that their wedding was packed full of vibrant punches + excitement. 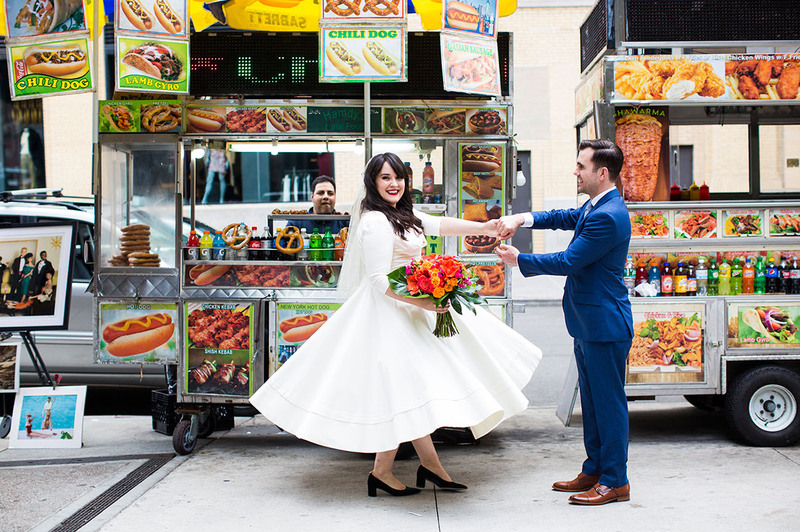 Kathryn even joked that the inspiration for the wedding day was, “EXTRA!” She shares: Having the wedding in Manhattan with views of the surrounding city was very important to us. 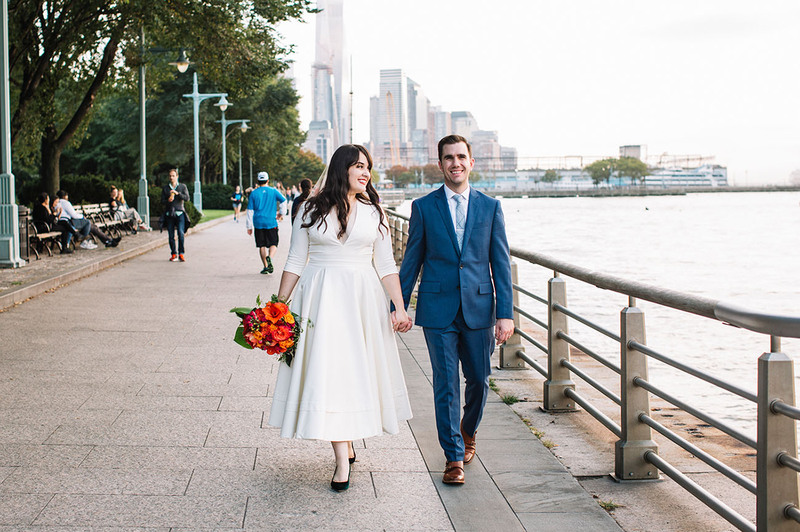 We are Oklahomans who have lived in New York City for the past 7 years, but just 2 months before the wedding we moved to North Carolina for Zach’s new job at Duke University. 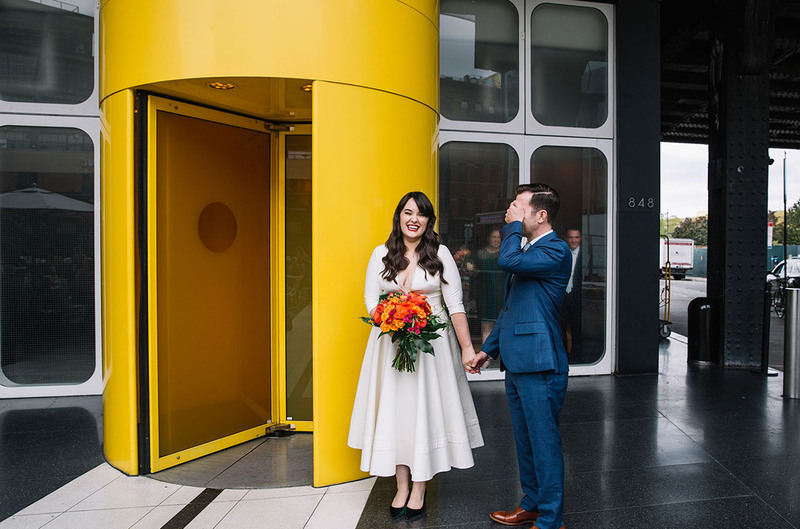 We absolutely loved our time in NYC and wanted our wedding to be a final hoorah in a place that means so much to us. 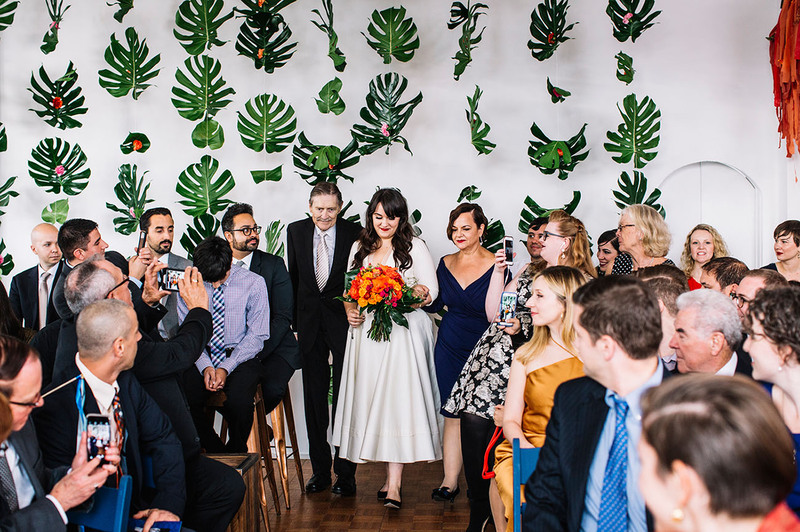 Most of our family traveled from other states and we were so excited to show them around town and to host them for a fun-filled weekend in the city. 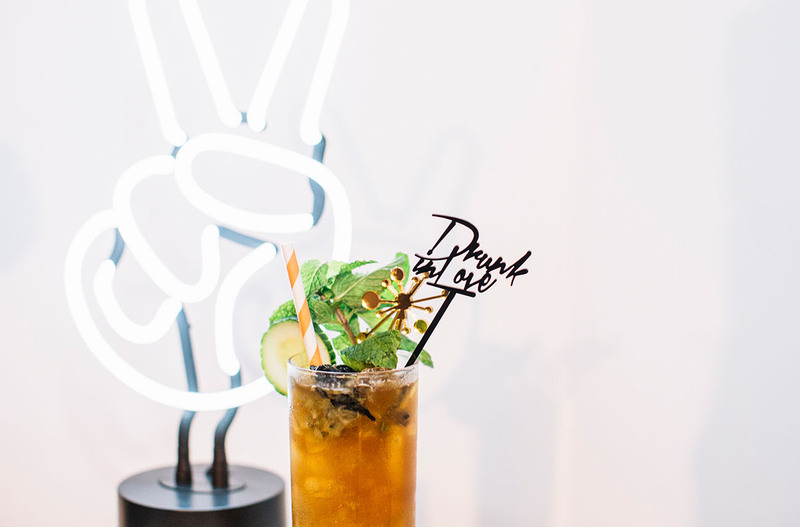 Now, ladies + gents, ready to see how they brought all the tropical vibes to The City? 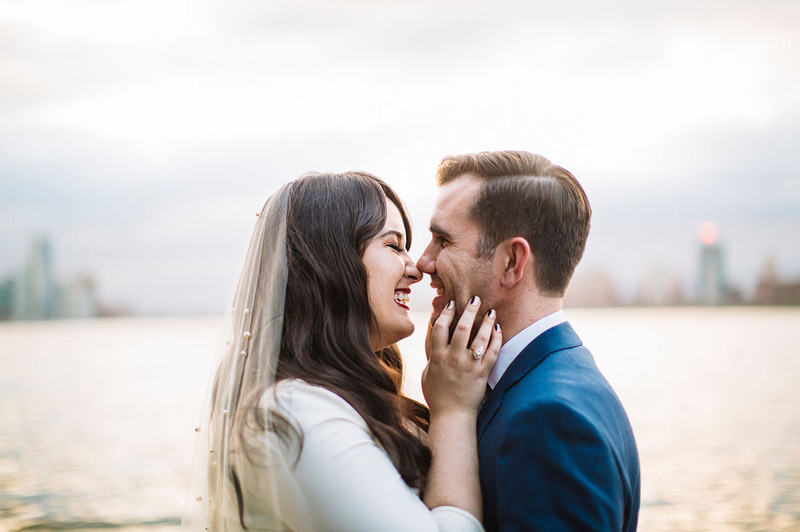 Let’s take a look at all the moments captured by Kate Edwards Weddings! 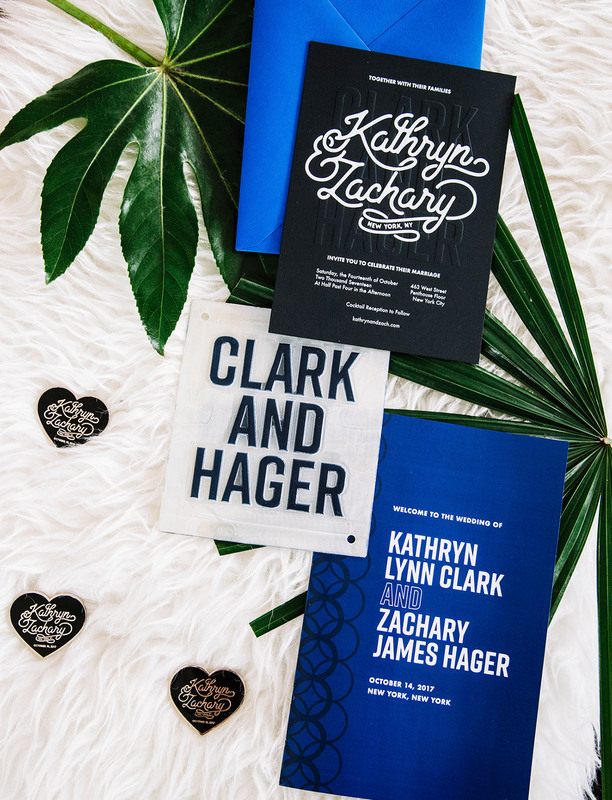 Packed with a punch from the start, Kathryn designed these modern invites to complement the vibrant swatches of color ahead! We told you the colors were going to be ever-present! 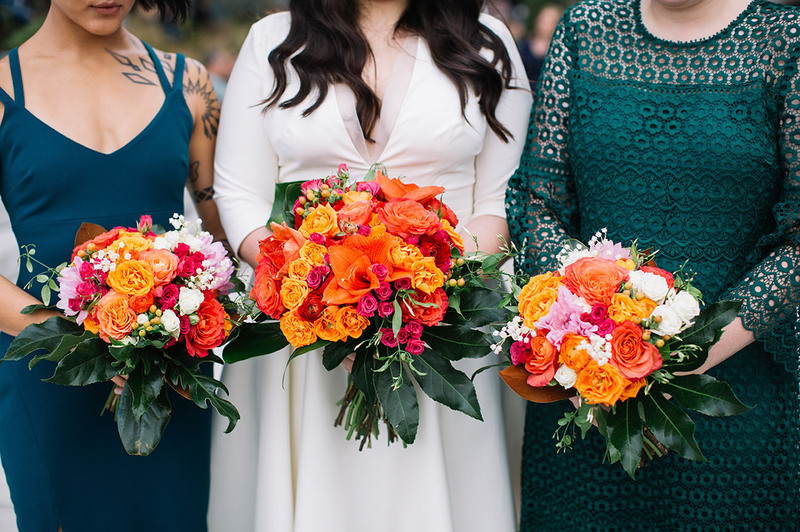 The bouquet by Gatherings Floral Design definitely tied in the saturated palette of oranges, pinks, and greens. 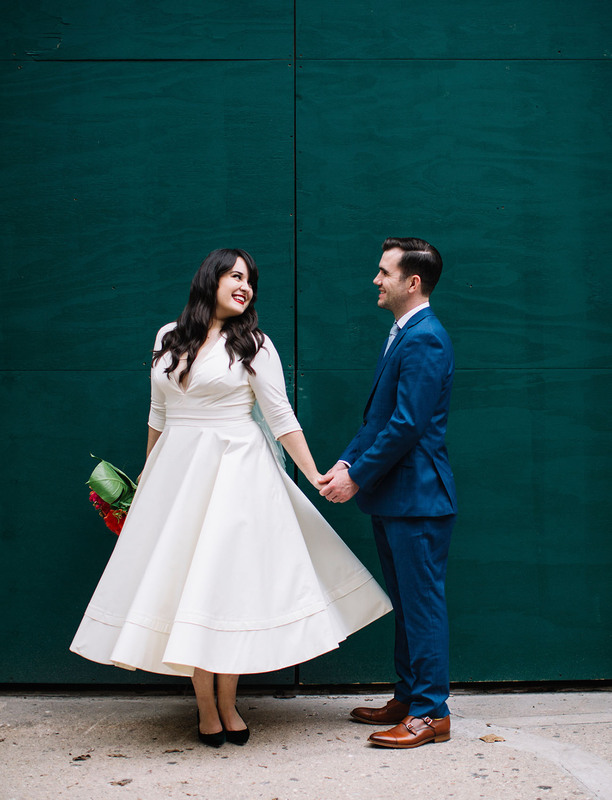 How darling is her modern midi wedding dress by Delphine Manivet? 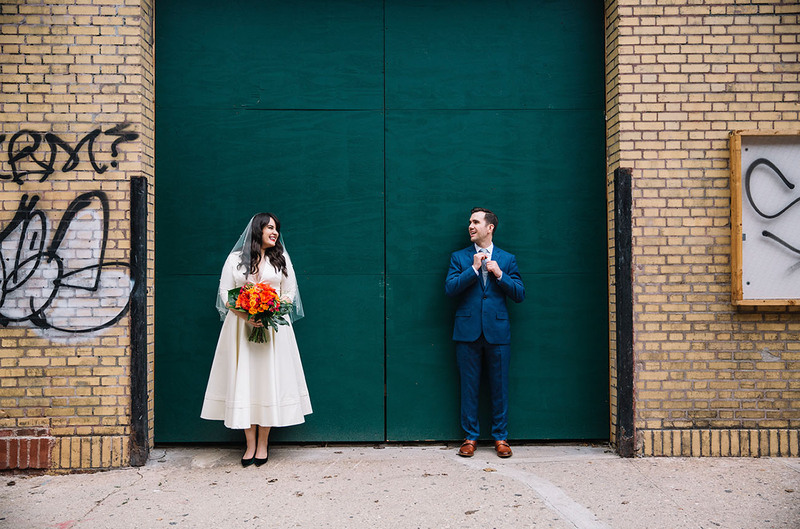 She snagged this style from The Mews Bridal. 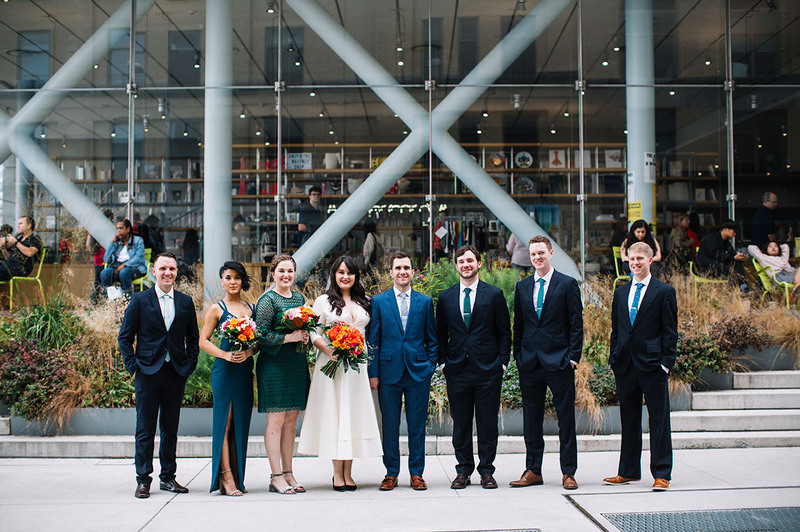 The ladies + gents all rocked cool shades of emerald green and navy blue. 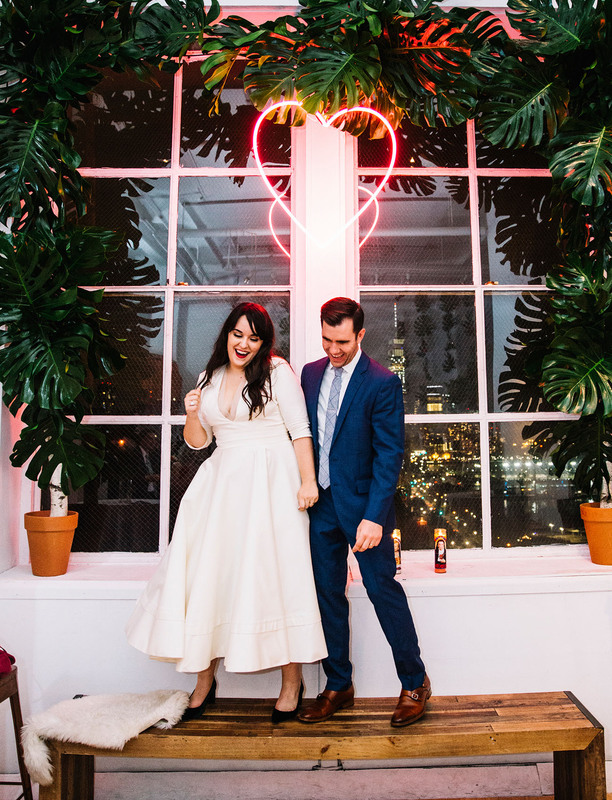 The two had Oldies to dance to throughout the night + neon signage and tropical plants to top it off! 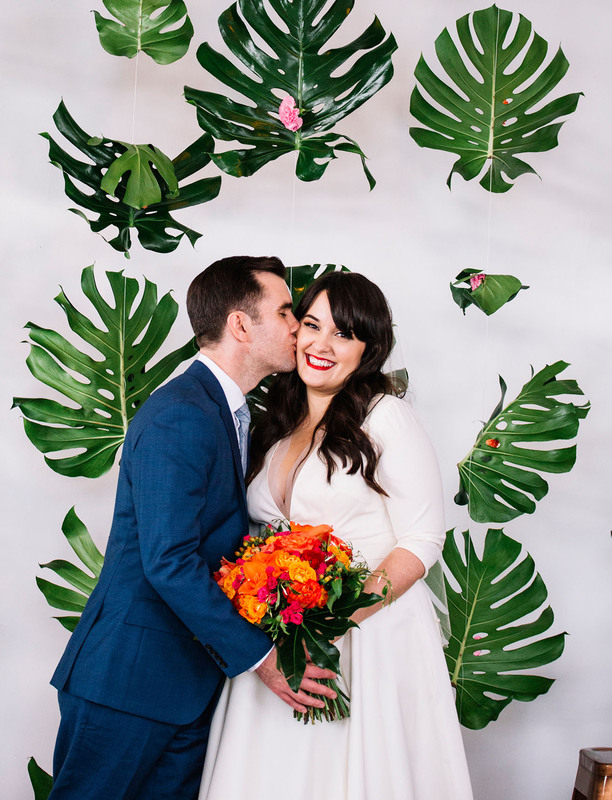 Can we talk about that monstera leaf backdrop for a moment? How fun is that?! 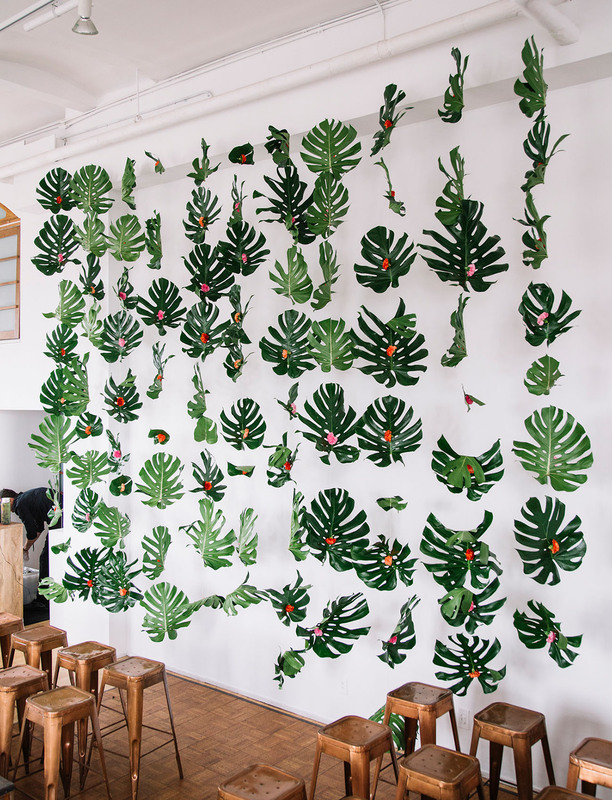 With the help of Skylar Arden Events, the entire space at Ramscale Studio turned into a tropical oasis! 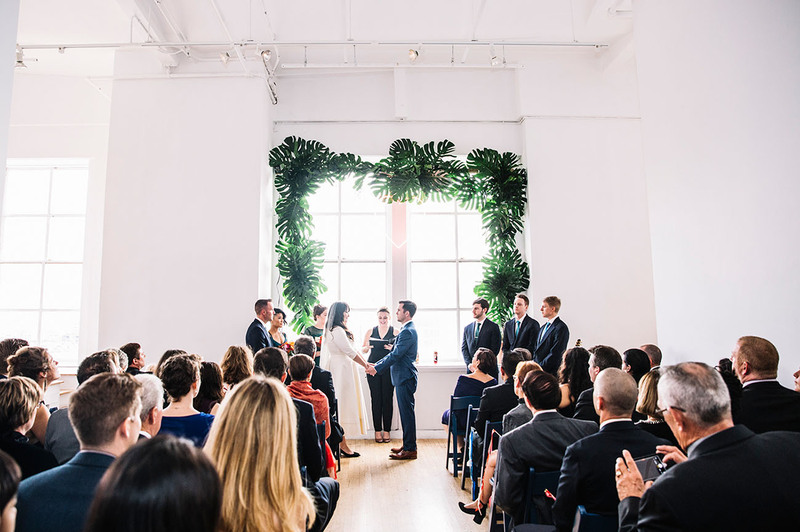 We did not want a traditional ceremony, instead we looked within our circle of friends and family to piece together something that would be very personal to us. It was officiated by the first friend that I made when I moved to New York, comedian, Jamie LeeLo. 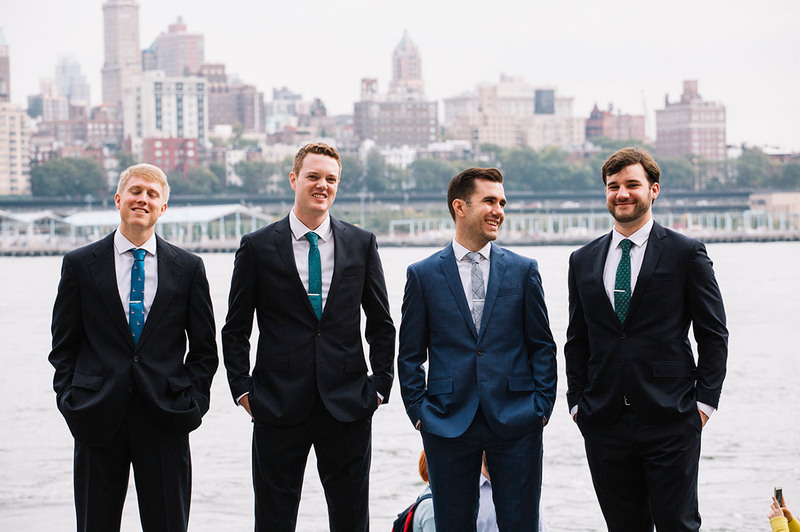 Cody, a friend from college who also served as a groomsmen, played the guitar and sang “I Will” by The Beatles. The pastor that officiated my parents wedding, read an excerpt from Paulo Coelho’s The Alchemist. 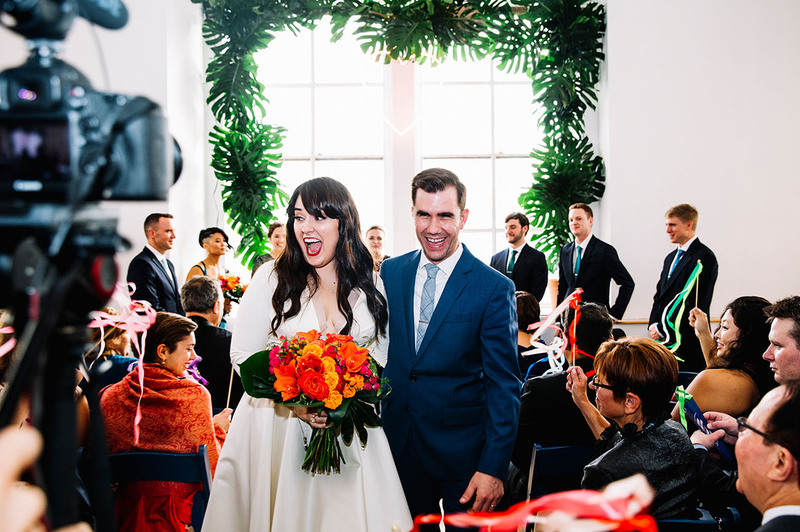 The result was a short, sweet and extremely personal ceremony filled with happy tears and joy. 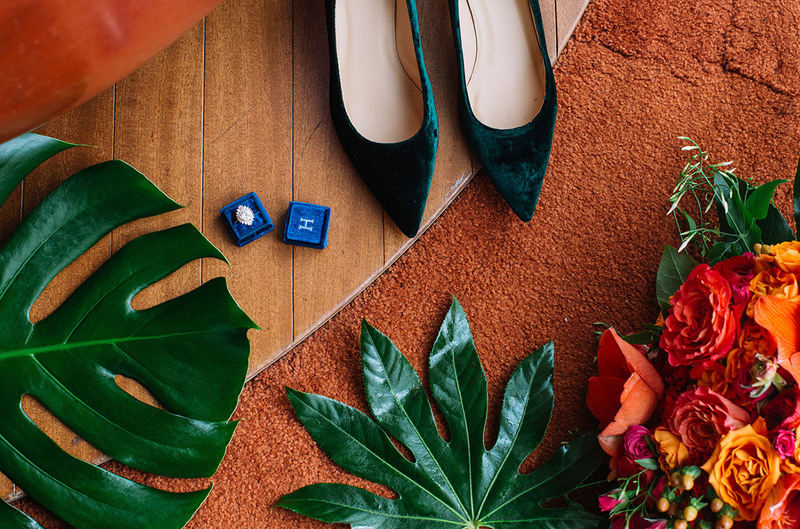 Don't pick a single wedding color. 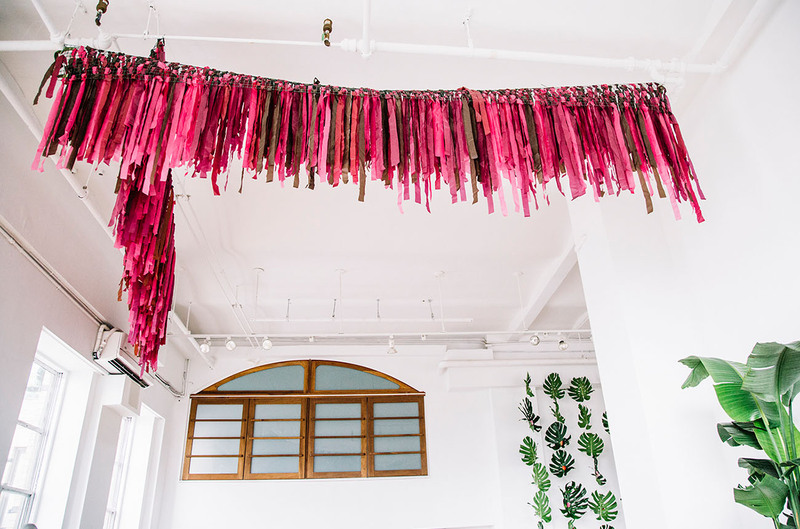 Create a palette of colors, patterns, textures (fabrics, metals, greenery) that you draw from throughout the design process. 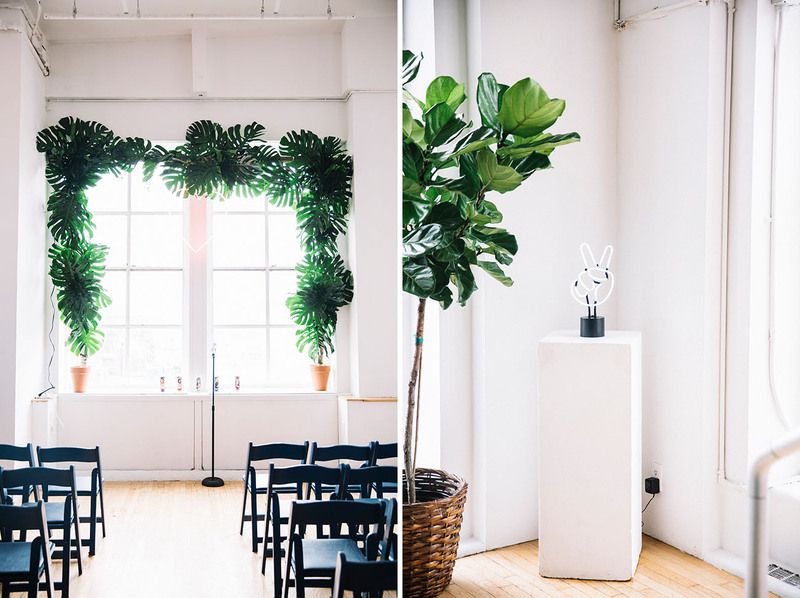 Kathryn tells us: A few of my favorite details that were sprinkled throughout the day include Mid-Century inspired drink stirrers, the Bertoia Chairs that were rented from Patina, our blind-embossed and white-foiled invitation (the printer didn’t think it was possible to do both techniques on top of each other! ), and the scattered pearl veil made by my mom! Our impromptu, un-choreographed interpretive dance to "Don't Stop Me Now" by Queen in front of a window featuring 1 World Trade in the background. 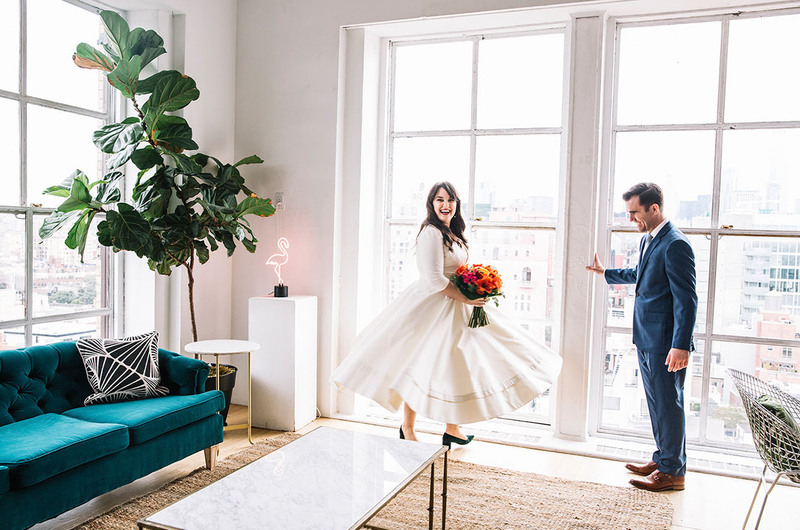 We’re all about those newlywed celebratory dance moves. Party on, you two!! 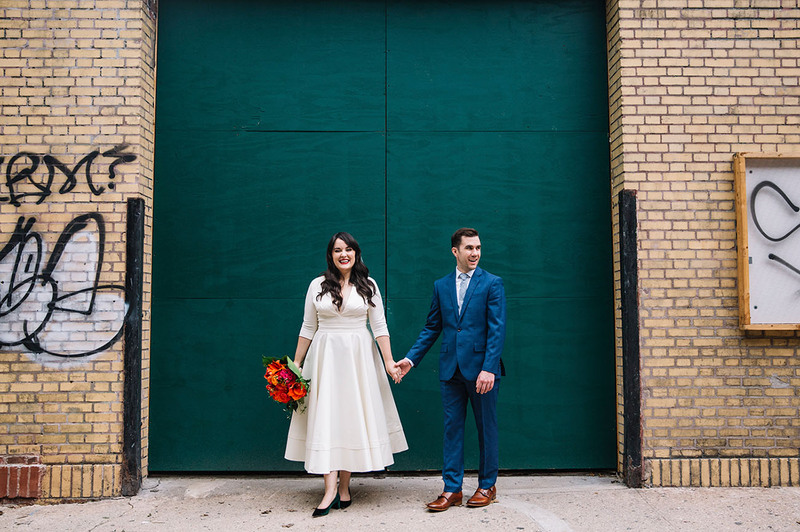 Love the style of this wedding.